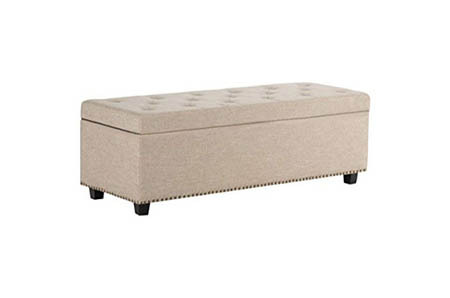 Practical, comfy, and fun, ottoman footstools make a great addition to your home. Looking for the perfect ottoman with storage? We’ve got you covered. Named after the empire in which it originated, the ottoman footstool is a stylish piece of upholstery that adds life and zest to your decor. These decorative and functional pieces of furniture are similar to a small sofa except they have no backrest or ends. You can use your ottoman as a seat, a table, or as a footrest. An ottoman with storage does double duty as a place to stash things and offers a comfortable place where people can sit. A good living room ottoman fits perfectly into any style of interior design whether vintage, sophisticated, or contemporary. We think that an ottoman has a place in every home. Check out our best-selling ottomans and find the one that suits your home best. Fashion meets function in the ottoman footstool. Whether you’re looking for a small ottoman or a statement piece like a large round leather ottoman, we’re sure that it will be the centerpiece of your room. Pick a spot for your ottoman where its style and functionality can be appreciated. Because these mini sofas are so practical, you can use yours as extra seating, as a coffee table, and as a storage space to name just a few uses. For example, a living room ottoman often doubles up as an extra sofa when guests visit. Consider the following factors when choosing an ottoman. You want to be sure that the one you pick perfectly suits your home, practical needs, and style. Size - Length and width are important considerations when choosing an ottoman. Do measure your space first so that you know exactly which ottoman will fit perfectly in your room. Don’t worry if you don’t have an expansive room, a small storage ottoman will be perfect for your space. Shape - Looking for a wow factor in your living room? A round leather ottoman could be exactly what you need. But if you prefer angular shapes, you might like an ottoman bench or a square ottoman. Squares and rectangles offer great space saving solutions because they fit snugly in corners or with L-shaped sofas. Materials - While many people think of ottomans as leather pieces of upholstery, in truth they come in many different materials. Many people go for a cloth ottoman because of the wide range of styles and patterns available. When you choose an ottoman footstool, consider the style of your existing decor and go with something that will complement your space. Color - Because there are so many great cloth ottomans, you’ll be able to find the color that perfectly suits your living room. And, of course, colored leather options are available too. A small ottoman often looks great in a punchy color like wine or fuchsia. Choose a living room ottoman in a bold color for a statement piece that instantly upgrades the look of your living room. Get ready for the best black faux leather ottoman, manufactured by: DHP, a radiant home décor stylish masterpiece. Made with the highest quality of faux leather, dimensions: 21.5x35x15.5in. Amazing modern ottoman, get it before it's gone! Discover the best brown faux leather ottoman, manufactured by SONGMICS, a cool living room fun accessory. Material: high quality faux leather, dimensions: 43-inch. Discounted shabby chic ottoman, and that's just the beginning! This is an amazing navy fabric ottoman, brand: Kinfine USA Inc., a must have home décor showpiece accessory. Material: top-notch fabric, dimensions: 19"x18". On sale, the best contemporary ottoman, looks absolutely amazing and unique! 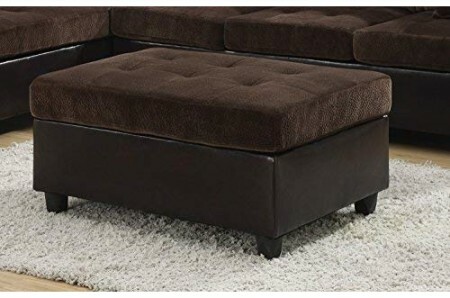 Update your style with this brown bonded leather ottoman, brand: Coaster Home Furnishings, a radiant living room showpiece accessory. Made with fine bonded leather, size: 26"Dx37.5"Wx19"H. Save money with this hollywood glam ottoman. Probably the coolest natural fabric ottoman, brand: Simpli Home, revives your style, a beautiful home décor elegant piece. Made with the highest quality of fabric, size: large. Low cost modern ottoman, a must have masterpiece! Finally the best black polyurethane ottoman, made by DHP, a beautiful living room fashionable piece. Made with supreme polyurethane, size: Small. Get the best price with this bergain shabby chic ottoman, it's incredible, magical and stylish! Black faux leather ottoman, produced by DHP, model: 2033009. Made of top-level faux leather, on sale, the best ottoman we found, amazing home décor masterpiece. If you're looking for a really unusual idea, check out this contemporary ottoman! Beige linen ottoman, manufactured by Belleze. Material: first-class linen, top of the line dramatic ottoman, a delightful living room showpiece accessory. Prepare yourself for the best hollywood glam ottoman, incredibly fun and stylish! Ingenious invention, check out this espresso faux leather ottoman, by: Belleze, a cool home décor layout accessory. Made with the very best faux leather. This is a top notch modern ottoman! Don't miss this amazing deal price, buy it now! Wow! If you are like us you've always dreamt on having this blue cotton ottoman, made by Cotton Craft, a heavenly living room showpiece accessory. Made with supreme cotton. A great deal for shabby chic ottoman, get it before it's gone! The astonishing best seller gray fabric ottoman, a piece by Convenience Concepts, surprising home décor design piece. Made with fabric. On sale, the best contemporary ottoman, what's not to love? a really unique deocr item. Dreamlike light grey fabric ottoman, manufactured by epeanhome. Made with top-notch fabric, this item received the best reviews for fabric ottomans, amazing living room accessory. Probably the coolest hollywood glam ottoman for sale. Now you can get the best boho fabric ottoman, produced by Rivet, a sublime home décor stylish accessory. Made with top-level fabric, dimensions: 20"Wx20"Dx17"H. Discounted modern ottoman, it's absolutely stunning and unforgettable. Add a splash of color to your day with this taupe/blue resin ottoman, brand: Keter, a heavenly living room classic accessory. Made with classic resin. We checked and it’s the best price for shabby chic ottoman, don't linger around! Chocolate brown polyurethane ottoman, brand: Kinfine, model: K6862-E846. Made of polyurethane, astonishing home décor fashionable piece. This is the coolest contemporary ottoman, this will put a smile on your face in the morning. Fine natural fabric ottoman, made by: Belleze. Made with top-level fabric, low cost divine ottoman, a cool living room stylish accessory. This is a epic hollywood glam ottoman, it's perfect and affordable decor idea! Buy it now. Absalom pouf cotton ottoman, by: Signature Design by Ashley, model: A1000550. 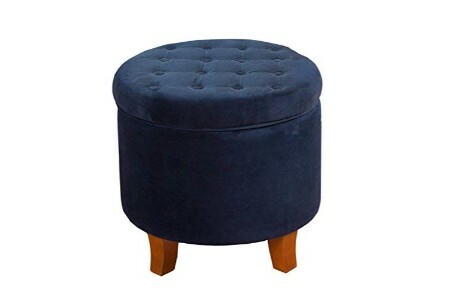 Material: cotton, an affordable gem ottoman, a must have home décor accessory, dimensions: 18.90"Wx18.90"Dx19.50"H. Ingenious top-selling modern ottoman. Incredibly cool, this amazing charcoal fabric ottoman, manufactured by: Belleze, amazing living room showpiece accessory. Made of fabric. An affordable shabby chic ottoman, a very unique décor piece that's sure to turn heads. Lookin for the perfect decor idea? You found it! Check this blue fabric ottoman, produced by Signature Design by Ashley, amazing home décor enhancement piece. Made with prime fabric, dimensions: 18.38"Wx18.38"Dx18.38"H. Really unique décor piece! Ivory fabric ottoman, created by Great Deal Furniture. Made with the highest quality of fabric, best savings for artistic ottoman, surprising living room adornment. Hollywood glam ottoman, it's incredible, magical and stylish! Tan linen fabric ottoman, produced by Kinfine USA Inc., model: K6377-F1326. Material: top-notch fabric, cheapest price for elegant ottoman, nostalgic home décor elegant piece. Prepare yourself for the best modern ottoman, fun and affordable. We can't get enough of this light grey fabric ottoman with storage, created by Otto & Ben, must have living room stylish accessory. Material: fabric, size 30". 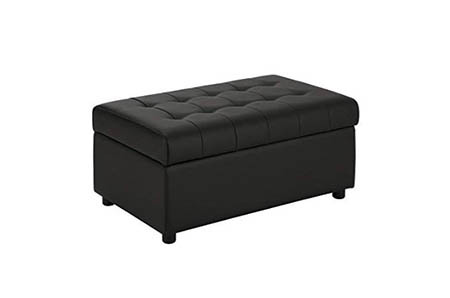 An affordable ottoman with storage, it’s an amazing décor item! White leather ottoman, created by Baxton Studio, model: BH-5589-WHITE-OTTO-2PC. 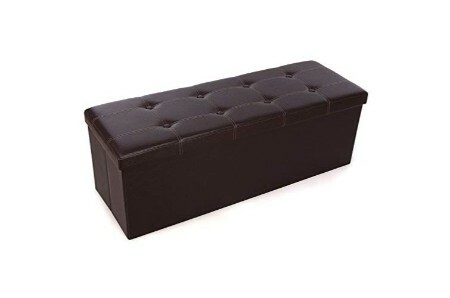 Made with prime leather, on sale, the best ottoman, a superb home décor accessory. If you are a fan of art you will love this contemporary ottoman, fun and affordable. Now you can get the best midnight black polyurethane ottoman, manufactured by Simpli Home, a heavenly living room fashionable piece. Made with supreme polyurethane, size 48". Low price hollywood glam ottoman, amazing and affordable unique piece! Over the last few years, ottomans have become an essential decorating piece. They are being used in all sort of creative, unique, and exciting ways. If you’re looking to add some pizzazz to your home, you can’t go wrong with an ottoman. Here’s how to use your unique ottoman as a decorative powerhouse. Lift your color game: Ottomans add spice to any color scheme regardless of the existing decor. They are an excellent way to add a pop of color to the room you want to decorate. Colorful ottomans can be used to enhance your existing color story or to take you in an entirely new direction. Create contrast: You can use your new ottoman to create contrast in a room that is monochromatic or bland. Pick an ottoman color that is opposite your existing wall color on the color wheel. White walls? Try a patterned ottoman in vivid tones. Powerful patterns: Don’t be scared to use some pattern in your home decor. Patterns can add pops of personality to otherwise drab spaces. Because there are so many fabulous patterned ottomans available, we’re sure that you’ll be able to find one that suits your space. If your home is decorated in a modern style, choose an ottoman with a bold, abstract print. Make a focal point: A focal point can virtually be any part of the room, but it’s often a major piece of furniture because it easily attracts attention. Making use of a luxurious suede ottoman can enhance your focal point and improve your overall decor and design. Tuck-away seating: Not everything is about style, functionality is always important. In this respect, ottomans are hard-working pieces. If your space is small, beautiful ottoman seats that tuck away under other furniture are the perfect way to merge style and function. The best-selling silver metal futon frame, produced by DHP, amazing guest room brilliant masterpiece. Material: prime metal, size: Full. Least expensive cost for contemporary futon frame, it's completely staggering. Now you can get the best black polyester futon mattress, made by: DHP, upgrades your style, amazing guest room adornment. Made of the highest quality of polyester. Highly recommended. Low cost contemporary futon mattress, a must try! Red fabric couch, a piece by Best Choice Products, model: SKY4545. Material: fabric, get it cheap, on sale, a delightful living room upgrade piece. The best-selling modern couch, it's absolutely stunning and unforgettable. This is hands down the coolest black leather couch, by: DHP, a heavenly living room enhancement piece. Made with prime leather, dimensions: 70.00x34.50x31.00Inches. Now on limited time discounts for modern couch, perfect! Blue mini fridge, made by Cooluli, model: CMF6B. Made of the very best materials, this is a bargain mini fridge, revives your style, size 4 liter. This is the coolest modern mini fridge, super fun! Get it now, on sale! Lavish dark brown, black wood floating shelves, manufactured by Love-KANKEI. Made of first-class wood, luxury jewel floating shelves, amazing home décor fine accessory. Get the best modern floating shelves, and it's beautiful!